Yeah going back a bit again 1969 some people think of this as a western but I don’t it’s set in those times but it ain’t at all like all those old cowboy films from the 50s its what is now known as a buddy movie. There are four things I like about this first Paul Newman and Robert Redford both rather tasty don’t you think well I do. Second its funny some of the lines are hilarious its dry wit though kind of supple and I like that. Third the other characters there all good and fourth the music which is unusual I suppose done by Burt Bacharach and sometimes sung by the Swingle Singers who do arabella music with no instruments and no words just singing sounds you may not like that and I can’t say I’ve got much on my iPod but for the film it works great. 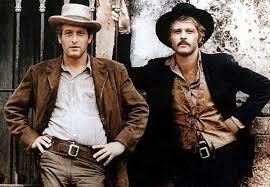 Butch and Sundance are outlaws part of the Hole in the Wall Gang it’s Butch’s gang really and they’ve been away for a while so when they get back to Hole in the Wall their hideout this giant guy Harvey thinks he’s taken over. He wants to settle it with a fight cos he’s so tough but Butch walks up to him and says he won’t start till they get the rules sorted out and he goes “Rules? In a knife fight? No rules,” and Butch kicks him right in the cobblers and wins. Oh, even before that right at the start we find out that Sundance is a famous gunfighter he’s playing cards and someone accuses him of cheating. Butch comes in and tries to reason with the guy but he won’t listen and Butch goes, “I can’t help you Sundance.” The guy just about craps himself and says “I didn’t know you were the Sundance Kid when I said you were cheating. If I draw on you you’ll kill me.” And Sundance goes, “There’s that possibility.” Cool as a cucumber. You know sometimes when I write these things I don’t want to tell you any good bits because if you haven’t seen it already there’s nothing like the first time but something like this you’ve probably seen before so shall I carry on I guess so. The screenplay (script) is by William Goldman and if this was all he ever done (which it wasn’t) he could of died happy it’s so good. Sundance has a girlfriend Etta (Katharine Ross) and they all decide to move to Bolivia to get away from the posse. There’s this nice bit of brown and white film as an interlude while they go to New York and get the boat to South America and the soundtrack goes all Swingle Singers and they arrive in this one horse town and Sundance is furious and then they find they have to learn Spanish to rob banks to tell the people what to do so Etta teaches them. It all gets very difficult and uncomfortable so she goes back home she’s a teacher and eventually the boys find themselves with half the Bolivian army against them. Its great so funny nice scenery good music and everything I know it word for word but I still love watching it cos it ain’t one of those macho bang bang things although there is a bit of shooting. One of my all-time favourite films Kaycee so thanks for reviewing. 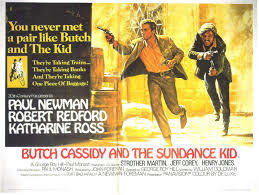 Butch and Sundance really were at their best in this. Off to listen to South American Getaway!